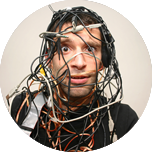 Funio Blog- Why is web hosting still so complicated? Why is web hosting still so complicated? After celebrating #BackToTheFutureDay and comparing futuristic products to reality, we realized that there are still no self-lacing sneakers. But the future is still here as we manage our bank accounts directly on our smartphones, and can get pretty much everything delivered at our doors in a few clicks. Still, some things are unchanged. Web hosting is one of them. Even though web hosting is a must for millions of people who need to promote their companies, services, and projects, being online remains an obstacle course. “It is counter intuitive that in 2015, complexity is still the norm in the industry. It is even worse actually: people have to adapt to this complexity when it should go the other way around!” explains Charles Francisci, Senior Director at Funio. How many different environments do you see every day? When we ask our support team, they admit spending a lot of time guiding clients through many interfaces, all of which are different from one another. WHM, cPanel, customer account, CMS… and many more. “Why isn’t there one single interface where you could manage it all without learning the insides and outs of a new environment?” asks Patrick Lepage, responsible of the customer support. After “what’s cPanel?” usually comes: “I don’t have my login or password!” Managing four different interfaces usually means four different login and passwords or more. Complexity just quadrupled. With so many logins and passwords, it is easy to be confused. Which account goes with which password? Once you master all theses interfaces, once you found your password, you need to know how to configure your hosting plan so that you can do what you need to do. Usually, it is not easy. At all. It can take too many steps and demands technical knowledge. Blocking an IP address, configuring an email account, redirecting domain names, etc. can be way too complex. In 2015, the web is still for those who have technical knowledge, to those who are ready to take the time needed to learn and master many interfaces. The paradox is blatant: everybody needs to be online, but managing one’s online presence requires you to be an expert. What about making this kind of hosting a thing of the past?